An old fashioned sweet parlour, cake shop and bakehouse all rolled into one. 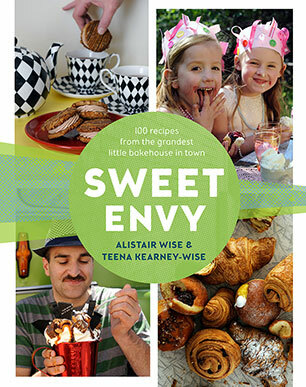 Sweet Envy is an old-fashioned sweet parlour, cake shop and bakehouse rolled into one destination of deliciousness in Hobart, Tasmania, and run by acclaimed pastry-chef Alistair Wise and his wife and business partner Teena. The recipes in this book are a snapshot -- a slice in time -- of the expert artisan produce of Sweet Envy: from pork & harissa sausage rolls and sticky pecan buns, to the perfect croissant, or a seriously haute-couture cake with lashings of buttery icing. Within these pages are over one hundred fabulous recipes for pastries, both savoury and sweet, desserts, tarts, old-fashioned sweets, biscuits, cupcakes, gorgeous celebration cakes and ice cream to drool over (you'll want to lick the page, seriously). The authors have worked in some of the most prestigious pastry kitchens and restaurants in the world, so these recipes are packed with the ancient wisdoms of professional pastry-chef experience. As well as this, their hilarious anecdotes and wry observations of community life among Hobart's farmers, foodies and friends, provide a refreshing and somewhat anarchic sense of humour not usually associated with the sweet art of baking. Alistair and Teena grew up and completed their pasty and bakery apprenticeship in Hobart, Tasmania. They went on to work in top restaurants in Melbourne, London and New York. In London, Alistair ran Gordon Ramsay's pastry kitchen at The Connaught alongside Angela Harnett; in New York, he worked at Gordon Ramsay at The London, which won Best Bon Bon Trolley on numerous occasions; Teena worked at The Greenhouse in London's Mayfair under an Bjorn van der Horst and then moved on to couture cakes to refine her skills as a cake designer. Now based back in Tasmania, Alistair and Teena have brought to life their own food destination, a specialised bakery in North Hobart, offering old-time sweets and confections lovingly crafted in small batches.